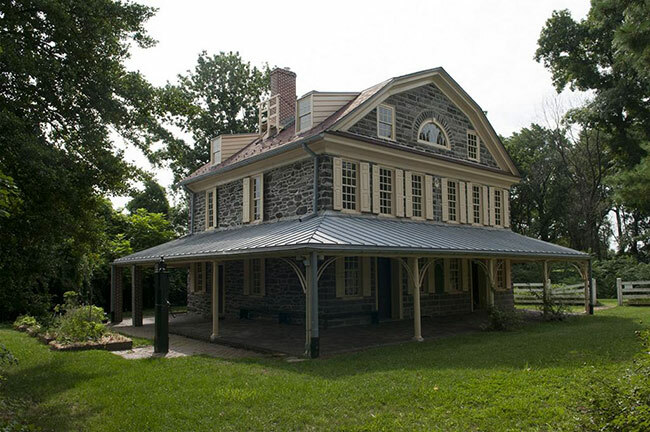 In partnership with the City of Philadelphia through the Department of Parks and Recreation, the Museum administers Cedar Grove and Mount Pleasant. These two colonial houses provide visitors with a glimpse into Philadelphia’s rich cultural heritage. 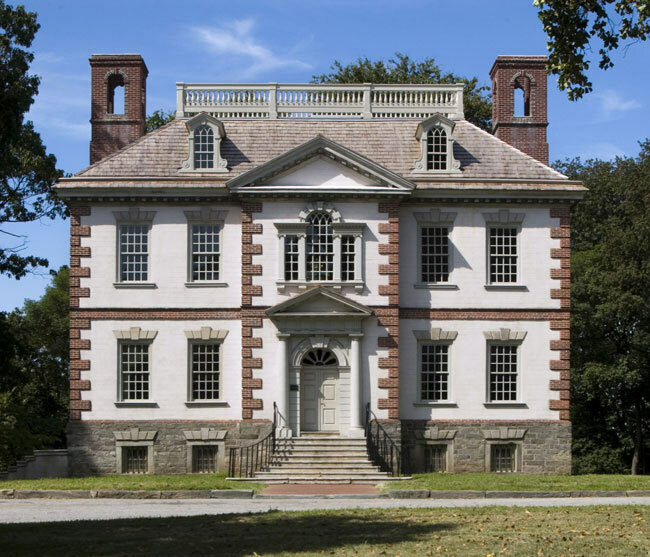 Cedar Grove and Mount Pleasant share the landscape of Fairmount Park with other historic houses, which together are considered among the most significant collection of early American homes in the United States. Cedar Grove, which was moved from its original site in the Frankford section of Philadelphia to Fairmount Park in 1926–1928, served as a summer residence for five generations of the Coates, Paschall, and Morris families of Philadelphia. In 1746, Elizabeth Coates Paschall, a widow with three children, purchased the property and within a few years began construction on a small summer house of grey native stone, consisting of the present dining room, upper bed chamber and back rooms. Cedar Grove began to evolve as the result of numerous additions made to it by succeeding generations of the family. Elizabeth's granddaughter Sarah, who inherited the house, married Isaac Wistar Morris in 1795. Soon after their marriage, Sarah and Isaac doubled the size of Cedar Grove—adding the half which now contains the parlor and the kitchen. They also added the third floor, incorporating the original gable roof into what is now a "broken pitch" or gambrel roof. The porch, or "piazza," was added later, giving the house its present appearance. The interior of Cedar Grove contains innovative features such as an indoor bake oven and hot water boiler in the kitchen, and an unusual two-sided wall of closets on the second floor. The house is furnished with exceptional examples of early Pennsylvania furniture, which have descended through the Morris family. The mixture of fine Baroque, Rococo, and Federal styles seen in its interior rooms reflects the evolution of the family's taste and their continued occupancy of the house through the mid-nineteenth century. Through the generosity of Lydia Thompson Morris, the last of the family to possess Cedar Grove, the house and its surviving original furnishings were presented to the city of Philadelphia in 1928. Scottish ship captain John Macpherson (1726–1792) and his first wife, Margaret, built their grand country estate on this site—high atop cliffs overlooking the Schuylkill River—between 1762 and 1765. They employed as their builder-architect Thomas Nevell (1721–1797), an apprentice of Edmund Woolley, the builder of Independence Hall. Macpherson and Nevell intended to make a bold statement with this house. Macpherson could announce his ambition to join established Philadelphia society, whose greatest city houses Mount Pleasant certainly rivaled. Nevell hoped to demonstrate his considerable craft and architectural knowledge. Together, they built one of the grandest homes along the Schuylkill, one that John Adams, on a visit to the residence in 1775, declared "the most elegant seat in Pennsylvania." Today, Mount Pleasant is considered one of the greatest American houses of its type, still standing on its original site in what is now Fairmount Park. The breathtaking beauty of the house's interiors and vistas, the elegance of the lifestyle of colonial elites, and the curiosities of Captain Macpherson's life are all on display at Mount Pleasant. The rooms in this colonial masterpiece feature the craftsmanship of some of the leading Philadelphia artisans, such as carver Martin Jugiez. In spring 2006, the Museum completed a 24-month preservation project to stabilize Mount Pleasant's timber-framed roof, restore the dormers and balustrade, and re-shingle both the main house and its two flanking pavilions. Such a project had not been undertaken since 1926, when the house was restored by the Museum under the supervision of the Director, Fiske Kimball.